Few business functions have greater impact than employment interviewing. Interviewing builds the future, for it is the way of hand-selecting those individuals who will become the face... the voice... the embodiment of the organization to its clients and customers. This holds true for employees at all levels of an organization, and across all job titles. Rather than being viewed as a way to shape the future, however, interviewing is frequently viewed as a burdensome administrative task... something that takes managers and HR professionals away from their "real" work. Mission-driven interviewing will enable you to recognize, maximize, and leverage the power and impact that is inherent to interviewing. Mission-driven interviewing encourages interviewers to take a more "macro" perspective (meaning, what is the mission of the position and the organization), in addition to a more traditional "micro" perspective (meaning, what kind of person do we need in this job). 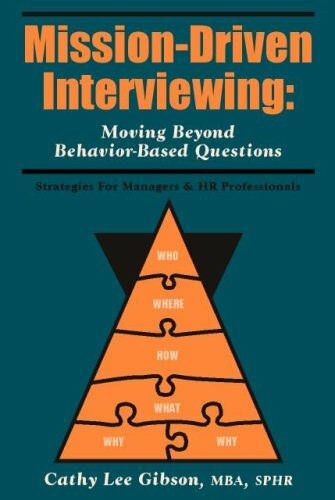 It also seeks to expand interviewers' focus away from an almost single-minded obsession with behavior-based questions by outlining complementary questioning techniques that will yield more accurate and complete job-related information about each candidate. In addition, mission-driven interviewing provides tools, techniques, and processes that encourage consistency throughout the interviewing process, all within a framework that affords interviewers ample flexibility to incorporate the realities of their organizations' cultures, as well as the nuances of their own personal styles. In short, with a mission-driven approach to interviewing, interviewers will develop the skills they need to find the "right" candidate -- the one who can meaningfully contribute to attaining the mission of the organization.